The Summit Police Department Boat Patrol is available to respond to incidents on many of the lakes within the Village of Summit. The boat patrol also performs scheduled enforcement patrols on the Upper and Lower Nemahbin Lakes, Silver Lake, and Golden Lake during the spring and summer months. 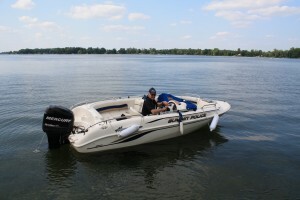 Summit Boat Officers works closely with the Wisconsin Department of Natural Resources to promote safety through boat contacts (Boat Traffic Stops), safety inspections, and boating education. The Wisconsin Department of Natural Resources provides parking lots at Silver Lake, Golden Lake, Lower Nemahbin Lake, Lower Genesee Lake, and Upper Genesee Lake. These parking lots are for use by vehicles that have launched watercraft only. Parking must be in marked stalls only. Please follow the signage in the parking lots. If you are driving to a lake to meet someone who has launched a watercraft, the DNR parking lots are not for you. Please car pool or find another location to park, so the lots can be used by vehicles launching watercraft at the boat access points. The Lower Nemahbin lot is for car-top parking only. The Village of Summit has ordinances restricting the operation of vehicles, ATV’s and snowmobiles on lakes within the village. For further information follow the “Summit Boating/Lake Ordinances” link at the bottom of the page. The Village of Summit has ordinances specific to activity on the lakes in Summit. Follow these links for more information.